For example, three different SQL Server developers can get the same data using three different queries, with each developer having his own approach to writing the T-SQL queries to retrieve or modify the data. But the database administrator will not be necessarily be happy with all of these approaches, he is looking to these methods from different aspects that they may not concentrate on. 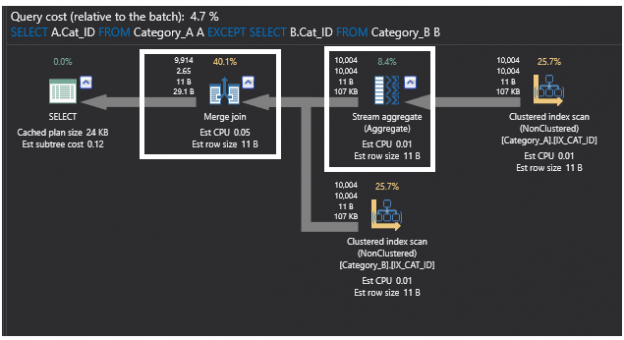 Although all of them may get the same required result, each query will behave in a different way, consume a different amount of SQL Server resources with different execution times. All of these parameters that the database administrator concentrates on shape the query performance. And it is the database administrator’s rule here to tune the performance of these queries and choose the best method with the minimum possible effect on the overall SQL Server performance. In this article, we will describe the different ways that can be used to retrieve data from a table that does not exist in another table and compare the performance of these different approaches. These methods will use the NOT IN, SQL NOT EXISTS, LEFT JOIN and EXCEPT T-SQL commands. Before starting the performance comparison between the different methods, we will provide a brief description of each one of these T-SQL commands. The SQL NOT IN command allows you to specify multiple values in the WHERE clause. You can imagine it as a series of NOT EQUAL TO commands that are separated by the OR condition. The NO IN command compares specific column values from the first table with another column values in the second table or a subquery, and returns all values from the first table that are not found in the second table, without performing any filter for the distinct values. The NULL is considered and returned by the NOT IN command as a value. The SQL NOT EXISTS command is used to check for the existence of specific values in the provided subquery. The subquery will not return any data; it returns TRUE or FALSE values depend on the subquery values existence check. The LEFT JOIN command is used to return all records from the first left table, the matched records from the second right table and NULL values from the right side for the left table records that have no match in the right table. The EXCEPT command is used to return all distinct records from the first SELECT statement that are not returned from the second SELECT statement, with each SELECT statement will be considered as a separate dataset. In other words, it returns all distinct records from the first dataset and remove from that result the records that are returned from the second dataset. You can imagine it as a combination of the SQL NOT EXISTS command and the DISTINCT clause. Take into consideration that the left and the right datasets of the EXCEPT command should have the same number of columns. Until this step, we can derive from the IO and TIME statistics that the methods that use the SQL NOT EXISTS and LEFT JOIN commands act in the best way, with the best overall performance. But will the queries execution plans tell us the same result? Let us check the execution plans that are generated from the previous queries using ApexSQL Plan, a free tool for SQL Server query plan analysis. Let us dive deeply to understand how each method behaves by studying the execution plans for these methods. The query that uses the EXCEPT command enhanced clearly after adding the indexes to the tables and become one of the best methods to achieve our goal here. This also appeared in the below query execution plan, in which the previous partial join operation is also replaced by the Merge Join operator, as the data is sorted by adding the indexes. The Hash Aggregate operator is also replaced now with a Stream Aggregate operator as it aggregates a sorted data after adding the indexes. SQL Server provides us with different ways to retrieve the same data, leaving it to the SQL Server developer to follow his own development approach to achieve that. For example, there are different ways that can be used to retrieve data from one table that doe not exist in another table. In this article, we described how to get such data using NOT IN, NOT EXISTS, LEFT JOIN and EXCEPT T-SQL commands after providing a brief description of each command and compare the performance of these queries. We conclude, first, that using the SQL NOT EXISTS or the LEFT JOIN commands are the best choice from all performance aspects. We tried also to add an index on the joining column on both tables, where the query that uses the EXCEPT command enhanced clearly and showed a better performance, besides the SQL NOT EXISTS command that still the best choice overall.